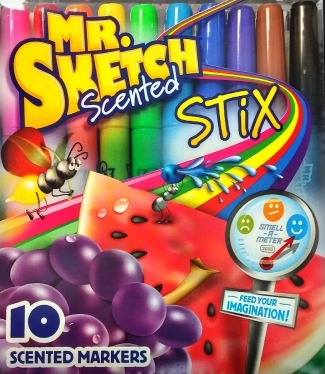 Fine .8mm Tip, 10-Color Set Fine, .8mm tip makes illustrating, lettering precise; great scents makes them fun! Non-bleeding, water-based ink. Nontoxic. Black/licorice, blue/blueberry, brown/cinnamon, green/mint, orange/orange, pink/watermelon, purple/grape, red/cherry, turquoise blue/fruit punch, yellow/banana.